In 2005 after years of ads with their original spokesman, Jimmy Dean the brand needed updating to reinforce their traditional breakfast cred and to launch their quick and easy-to-prepare products. The new campaign we created revolved around the Sun, his breakfast habits, family life, co-workers Cloud and Moon and how Jimmy Dean fits this hectic, on-the-go lifestyle with the tagline, “Happy Breakfast”. This U.S. national campaign was a hit and over a decade later the campaign was still running with sales growing every year. VIDEO SERIES A 60 minutes style mock doc behind the scenes video series where fans could learn more about the Sun, the Cloud and the Moon characters. Bogart’s, a classic Vancouver Chophouse restaurant, wanted a campaign to bring in local Vancouverites. We created a low budget campaign that plays off the restaurants cinematic name and used treated stock images, footage and music to evoke a classic 1940’s feel. This campaign got noticed in Vancouver and by the ad industry being shortlisted at Cannes and winning a ton of awards. 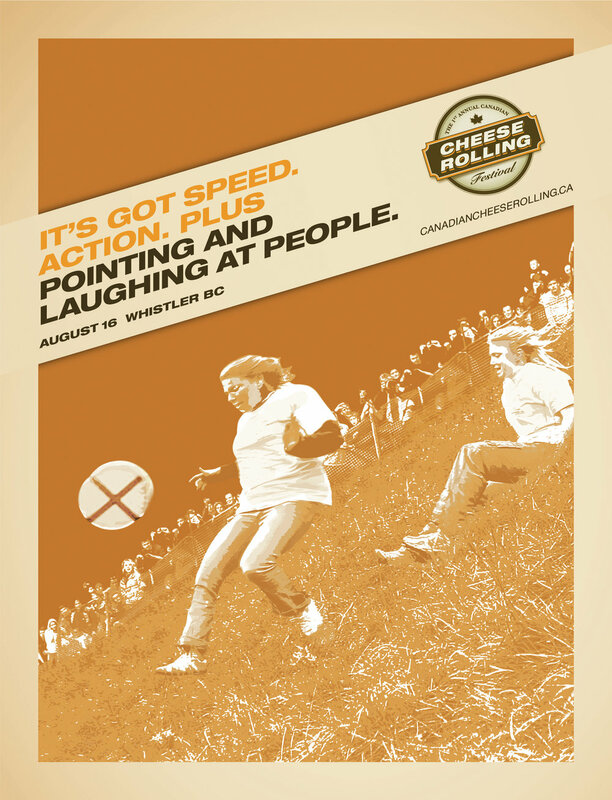 In 2008, to promote Canadian cheese in BC, we created the 1st Annual Cheese Rolling Festival. For the first time in history, cheese rolling races were held in North America. Over 5,000 spectators came to cheer on 200 daredevil racers as they tripped and fell down a mountain after a speeding wheel of cheese. The campaign picked up many awards and the became a yearly event in Whistler, BC. growing in popularity every year.